The SeaSpray concentric nebulizer offers outstanding nebulization efficiency for trace level analyses. It offers freedom from clogging while nebulizing solutions to the limit of solubility of most mineral salts, and conferring significant sensitivity gains. All SeaSpray U-Series nebulizers are supplied with the EzyLok argon connector. SeaSpray EzyFit nebulizers with an ‘E’ at the end of the part number are supplied with EzyLok argon connector. The MicroMist micro-uptake glass concentric nebulizer offers high performance for limited sample volumes. It makes routine ICP-MS Hg determinations possible and reduces matrix effects when used with Glass Expansion’s Cinnabar spray chamber. 1 x EZT-050, EzyFit connector with 1.3mm OD x 0.50mm ID x 700mm long sample tubing. 1 x EZT-025, EzyFit connector with 1.3mm OD x 0.25mm ID x 700mm long sample tubing. All MicroMist U-Series nebulizers are supplied with the EzyLok argon connector. MicroMist EzyFit nebulizers with an ‘E’ at the end of the part number are supplied with EzyLok argon connector. The Conikal concentric nebulizer gives the most reproducible results for standard ICP analyses. It represents the choice nebulizer for high precision, routine aqueous and organic applications. All Conikal U-Series nebulizers are supplied with the EzyLok argon connector. Conikal EzyFit nebulizers with an ‘E’ at the end of the part number are supplied with the EzyLok argon connector. DuraMists with sample uptakes 0.4 and 1.0ml/min are supplied with 1 x NFT-050, UniFit Connector with 1.3mm OD x 0.50mm ID x 700mm long sample tubing. * The DuraMist nebulizer is recommended for samples containing up to 5% HF. For samples with higher concentrations of HF, we recommend the OpalMist PFA nebulizer. The PolyCon concentric nebulizer represents the choice nebulizer for high precision analyses involving samples digested in HF. The PolyCon has been used successfully in ICP desolvators such as the MCN-6000, where high temperatures are encountered. It has become a favourite in the semi conductor industry, and has enabled analysts to produce accurate (r = 0.9998) calibration curves for low-ppt levels of Na, K, Fe and Ca in 30% hydrogen peroxide. PolyCons with sample uptakes 0.05 – 0.1ml/min are supplied with 1 x NFT-025, UniFit Connector with 1.3mm OD x 0.25mm ID x 700mm long sample tubing. 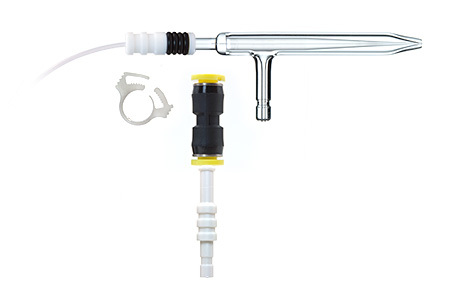 PolyCons with sample uptakes 0.2 – 0.8ml/min are supplied with 1 x NFT-050, UniFit Connector with 1.3mm OD x 0.50mm ID x 700mm long sample tubing. 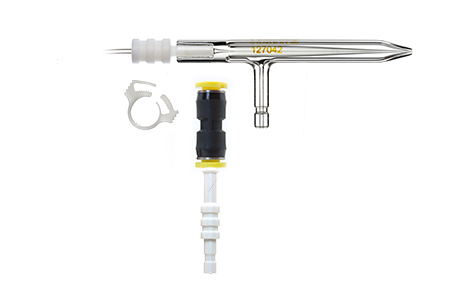 PolyCons with sample uptake 2ml/min are supplied with 1 x NFT-075, UniFit Connector with 1.3mm OD x 0.75mm ID x 700mm long sample tubing. The OpalMist PFA concentric nebulizer is the nebulizer of choice for high precision analyses requiring the highest chemical resistancy to HF, alkalis and organics. The high purity PFA construction makes it ideal for ultra-trace ICP-MS work. 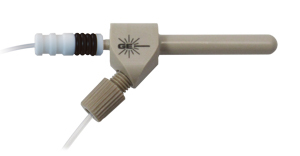 OpalMists with sample uptakes 0.05 – 0.1ml/min are supplied with 1 x NFT-025, UniFit Connector with 1.3mm OD x 0.25mm ID x 700mm long sample tubing. OpalMists with sample uptakes 0.2 – 0.8ml/min are supplied with 1 x NFT-050, UniFit Connector with 1.3mm OD x 0.50mm ID x 700mm long sample tubing. OpalMists with sample uptake 2ml/min are supplied with 1 x NFT-075, UniFit Connector with 1.3mm OD x 0.75mm ID x 700mm long sample tubing. The Ceramic VeeSpray nebulizer is made from alumina ceramic, making it ideal for HF analyses. It provides reproducible performance when working with samples containing large particulates. It has the same 6mm diameter as the standard concentric and the Alumina material makes it the most robust and abrasion resistant ICP nebulizer.